Breathing is the most important thing we do as humans and is vital for life to exist. Improper breathing results in insufficient oxygen to our cells and organs and causes tightness in our neck and shoulders. Most people breathe shallow because they use their chest to breathe. 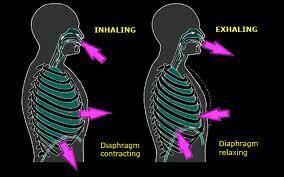 Proper breathing is done from your diaphragm and it is the natural way babies breathe. Somewhere along the way we forget how to breathe naturally and began to force our breath. Today you will learn how to breath deep and experience the healthy benefits of diaphragmatic breathing. Follow these steps and enjoy the power of breath. 1. Inhale through your nostrils. As you slowly inhale, place your hand on your abdomen and feel the air filling up your stomach, then up to your diaphragm (the muscle just below the lungs), into your lower chest, then to the middle of your chest, and finally reaching your upper chest. 2. Exhale through nostrils. The air will travel back down from your upper chest, to the middle chest, to the lower, and down to your stomach. Draw your stomach in towards your spine, squeezing the air out. 3. Repeat this 10 times. Do this several times throughout the day or if you are feeling tense or need an energy boost. You will find that the more often you breath this way, the easier it gets. Eventually you will breath this way naturally without thinking about it. You can breath through your mouth as well, but when you breath through your nose the impurities in the air are filtered by the cilia in your nose. Give it a shot . Your body will thank you. Enjoy!